The High Energy Laser Technology Demonstrator is continuing on track to become the centerpiece of the US Army’s laser-based defense capabilities. 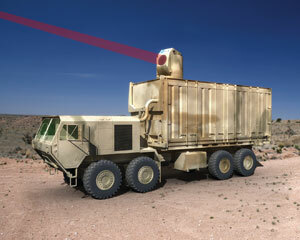 The project, which includes components from Boeing Defense, Space and Security of St. Louis and from Oshkosh Defense of Wisconsin, features a compact high-energy laser system mounted on a military truck. When completed, the design is expected to protect soldiers from incoming rockets and other artillery when their own use of gunfire is restricted. The weapon system, also called HEL TD, reached a milestone this summer when Boeing began work on integrating its laser beam control system into the Heavy Expanded Mobility Tactical Truck from Oshkosh Defense. Boeing had taken delivery of the eight-wheel, 500-hp vehicle last December. The integration work is being performed at Boeing’s facility in Huntsville, Ala. The High Energy Laser Technology Demonstrator being built for the US Army by Boeing and other companies is designed to protect soldiers from incoming missiles. Courtesy of Boeing. In operation, the HEL TD will fire an approximately 100-kW laser – with a tactically relevant range of up to 10 km – at threatening rockets and mortar shells. The beam control system from Boeing will simultaneously track each target, determine an appropriate aiming point and direct the outgoing beam. The beam will have sufficient power within its range to explode any missiles well before they can do harm to soldiers on the ground. The beam control system, which features a beam director assembly made by L-3 Brashear of Pittsburgh, is scheduled to be completed in 2011. Low-power tests of the system against real targets also should be carried out during the next year, according to Blaine Beardsley, Boeing’s program manager on the project. The tests, which will use a surrogate for the high-energy laser under development, are scheduled to take place at White Sands Missile Range. The HEL TD is similar in concept to the earlier Mobile Tactical High Energy Laser (MTHEL) system, which was discontinued by the Army. However, the MTHEL depends on a chemical laser that was balkier, required cooling and needed much larger vehicles for transport. The HEL TD system, on the other hand, uses a much more compact and stable solid-state laser. High-power tests of both the beam control system and the actual Ruggedized Solid State Laser destined for the mobile weapon are to be conducted by 2015. “HEL TD is a cornerstone of the Army’s high-energy laser program and will support the transition to a full-fledged Army acquisition program,” Beardsley said. 1. The anode or anticathode of an x-ray tube that emits x-rays when bombarded by electrons. 2. The screen in a television imaging tube that is scanned by an electron beam to determine the charge-density stored on it.